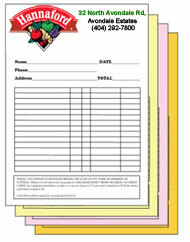 Business forms can be printed in full or 4 colors to give a more vibrant look. You can get creative with the design and add a logo with colorful graphics and text to your invices, receipts, work orders, receipt books etc. Puchase your sales, billing, delivery, inventor invoice from designsnprint and safe money and time. We print on premium quality paper for cheap prices. We print full color invoice to fit all your business needs. Your business name can be written in whatever font style that works for you. The ink color can compliment your brand and business colors for consistency. Make every receipt that’s written count by being more efficient with the design and printing. Size: 8 1/2" x 11" - Turnaround: 5-7 days - Full color. • Two part invoice forms for invoicing customers. • Standard colors blue-PMS, Brown, Burgundy Gray Green, Orange, Pantone Purple, Red . • Custom Full color Invoice business forms. We are located in Atlanta but we you can find our invoice printing services in any state, like New York and Houston Texas. We are an expert large format poster printing company that put our customers first. You can consecutively number each page with any sequence of numbers, printed in black or red. The pages can be perforated for easy separation. The book is constructed in a booklet or snap set format on 20 lb carbonless paper. 2, 3 or 4 parts per set are printed for your convenience. Receipt books are used in sales of products and services.